In a large mixing bowl pour in 3/4 of the flour leaving a hole in the middle. Mix the yeast with a pinch of sugar and some of the lukewarm milk. Place the yeast mixture in the hole and cover with a towel. Let sit for 1/4 an hour in a warm place. Afterwards, add the butter, salt, lemon, cardamon, eggs, milk and flour to the mixture. Knead dough until smooth. Once a ball of dough is formed add the remaining raisins and fruit. Knead entire mixture and make a log and divide into four balls. Place in a greased spring-form pan with a tube. Cover with a cloth and let rise for 20 minutes in a warm place. Brush dough with a beaten egg yolk and place in the oven at 350 F. Bake for 30 minutes or until golden brown. Cool cake before removing from pan. When cooled frost the cake with 2 Tablespoons of Icing Sugar mixed with 2 Tablespoons of Lemon Juice. Decorate with candied cherries. 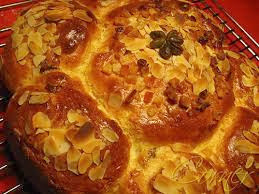 Traditionally, a golden crown is placed on top of the cake.